Says Herman van den Dungen about his brand name: "In Italian, it of course means First Moon. My grandmother, an aristocratic lady in a small Dutch village, called my grandfather Herman Maantje, meaning Little Moon. The name stuck with the villagers and me." (And for those suspicious of the name's true Italian roots, there is a small town 50 kilometers north of Milano called Primaluna, near Lake Como.) Adds Kevin Deal, PrimaLuna's exclusive US distributor: "Herman is the Benelux importer for Krell, Conrad-Johnson, Sonus Faber and the man behind Ah! Tjoeb, a brand I'd imported from him for a while. For PrimaLuna, Herman commissioned Marcel Croese who was Goldmund's chief engineer and designer. Herman and Dominique bought a house in China and she is learning the language." "Like them, Marcel is nothing but a perfectionist. We had the first production run of the new preamp ready to roll. Marcel grabs a sample and puts it on the bench. It checks out beautifully as does everything about the way it's built. What does he do? He takes a sensitive heat probe and measures every single part while he's stressing the unit. He discovers one part that runs a bit hotter than he likes. Herman shuts down the entire production and insists the part get changed." "That's why this stuff is as good as it is. There are no shortcuts, no compromises. 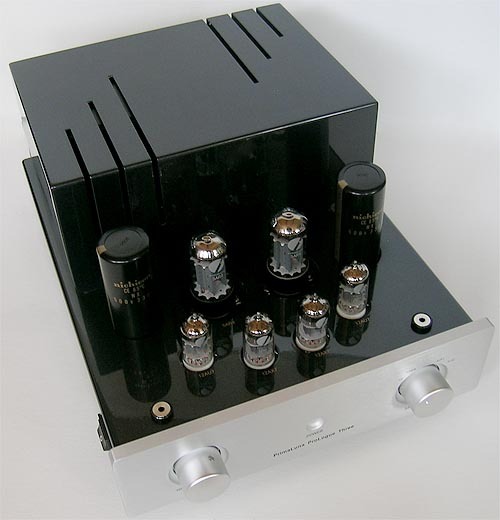 Our failure rate in the field, of our Component of the Year 2004 in HiFi+, the ProLogue Two integrated? Nada. Zero. Listen, I love selling affordable stuff but not if it breaks. 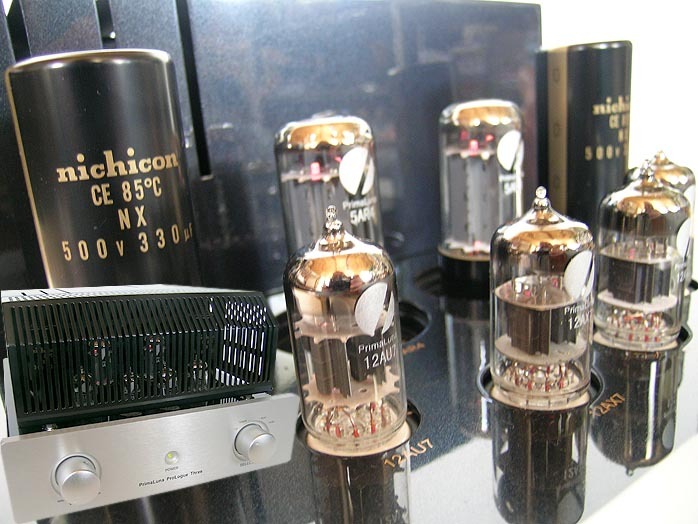 Since we're tube guys and many newbies are gun shy about valves, we insisted that our amps would be self-biased, wouldn't sacrifice parts should a tube go bad and run perfectly with non-matched bottles. And that's exactly what Marcel and Herman have accomplished. As an old veteran in the retail trenches, I had some input into certain features. Make sure you check out how these things are put together. There's nobody in the business right now who can beat us on how well our components are crafted." Arriving triple-boxed, white gloves and owner's manual in their own foam insert recess, Kevin's enthusiasm translated from the moment the FedEx man left. Inspecting the midnight blue five coats of hand-rubbed (slightly metallic) lacquer and the flawless fit of all external panels and connectors confirmed it. Looking inside killed a whole flock of birds with one stone. Close-ups anon. 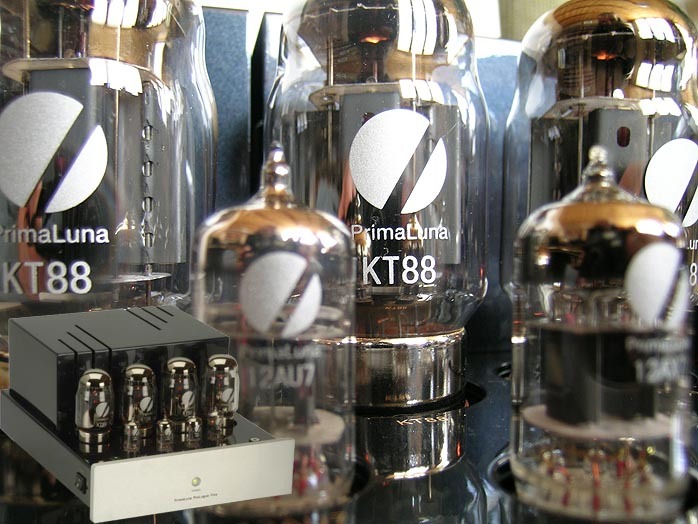 The ProLogue 3 is PrimaLuna's dedicated dual-mono, non-inverting tube preamp. It's valve-rectified, can take an optional MM phono board and runs two 12AX7s and 12AU7s each. 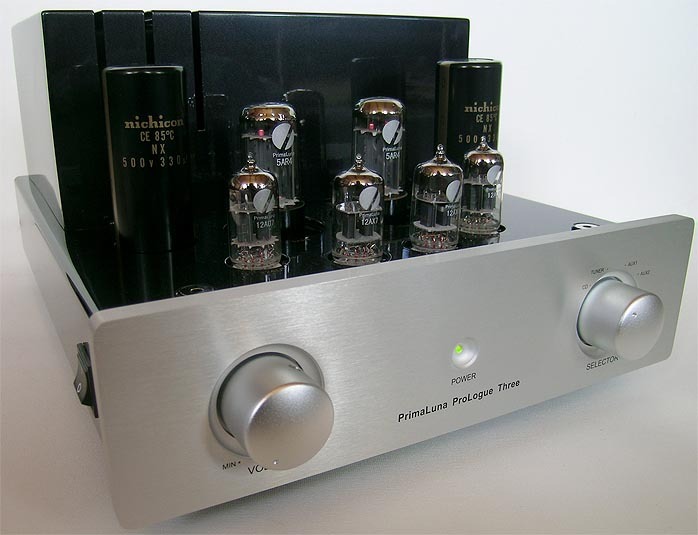 With the power mains discretely tucked on the left side just behind the silver (or black) fascia, the rear offers four pairs of RCA inputs, one fixed out and two variable outs. 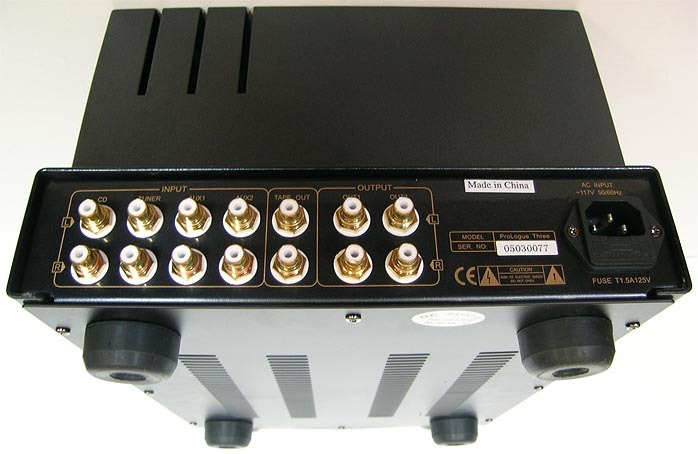 Gain is a low 12dB for a superior S/N ratio of 93dB, A-weighted at 775mV. Frequency response is 4Hz - 110kHz +/- 3dB. Input Z is 100kOhm, input sensitivity 150mV, output Z 2.8kOhm. Weight is 23.5 lbs, dimensions are 15.5" x 11" x 7.5" D x Q x H.
Tube rollers can have fun with ECC83/803S, E83CC, 7025, CV4004 and low-gain 5751 in place of the stock 12AX7s; ECC82/802S, E82CC, 5814, 6189 and CV4003 in place of the stock 12AU7s; and GZ34, CV1377, 5V4G, 5T4 and 5Y3 instead of the stock 5AR4 rectifiers. An auto-mute soft-start feature turns the frontal power LED from red to green in about 30 seconds. The chassis is heavy-gauge steel, fully vented at the bottom. 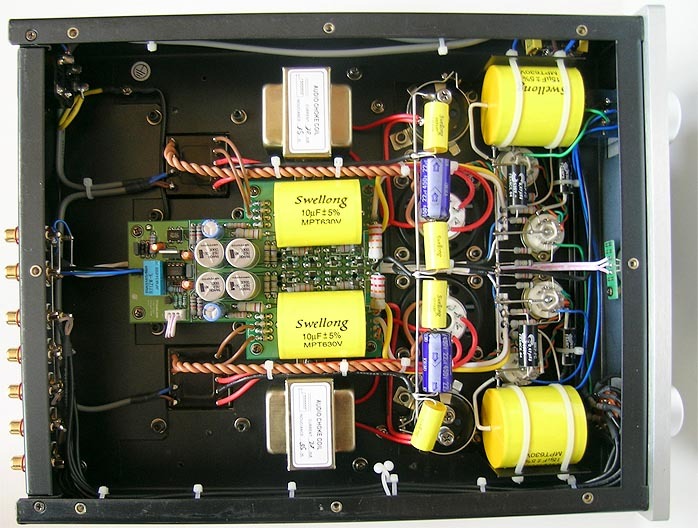 Separate toroidal power transformers feed each channel's choke-regulated power supply for true dual-mono geometry. Parts goodies include Nichicon, Solen and Swelling capacitors; an Alps attenuator; ceramic tube sockets; and panel-mounted gold-plated connectors. The innards clearly show the dual-mono layout with the two transformers and chokes.